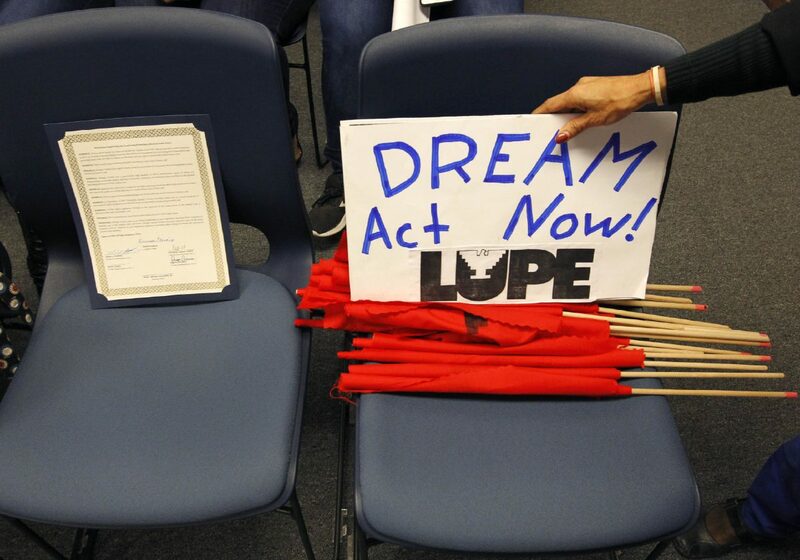 LUPE's Martha Sanchez places a sign is support of the DREAM Act on a chair next to a proclamation read by Hidalgo County Pct. 4 Commissioner Joseph Palacios in support of DACA recipients Tuesday, January 16, 2018, in Edinburg. EDINBURG — Hidalgo County commissioners voted unanimously Tuesday to pass a resolution in support of DACA and the efforts of Dreamers, but just hours later the Justice Department announced its intent to ask the Supreme Court to overturn a federal court’s ruling delaying the program’s end. A week removed from a federal court’s ruling to delay the end of the Deferred Action for Childhood Arrivals program, county officials here passed a symbolic resolution to support Dreamers at a time when congressional leaders are working to negotiate a deal to replace the Obama-era program designed to shield more than 700,000 recipients from deportation. Citing the contributions Dreamers make to the county, state and country, Hidalgo County Precinct 4 Commissioner Joseph Palacios read the resolution to a packed commissioners court that included members from different immigrant advocate groups. 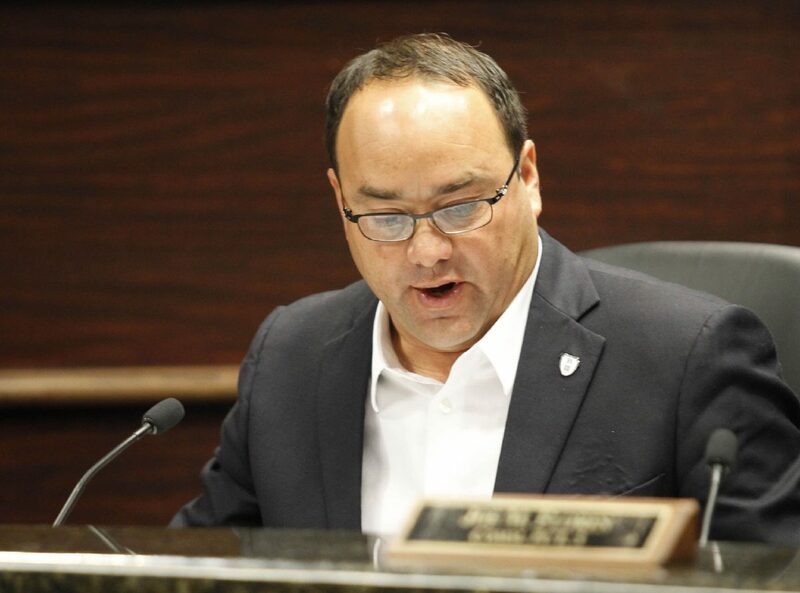 “… Hidalgo County is the most populated county in the state of Texas bordering Mexico and has a particularly high number of DACA beneficiaries, many of whom are distinguished community pillars, and they bring skills, ingenuity and resilience that contribute to the growth and competitiveness of our region,” Palacios said. 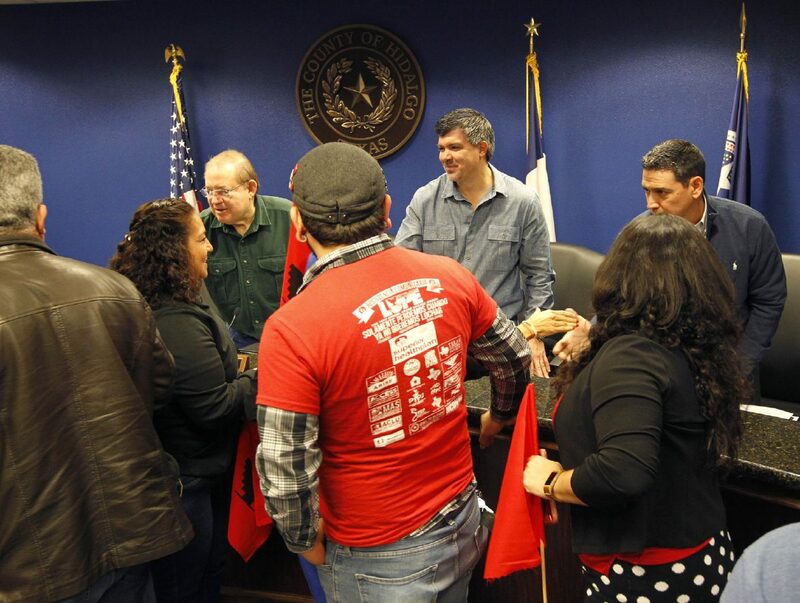 Hidalgo County Judge Ramon Garcia, behind left, and Commissioners Eddie Cantu and David Fuentes greet members of La Union Del Pueblo Entero following a proclamation in support of DACA recipients Tuesday, January 16, 2018, during a commissioners court meeting in Edinburg. Rev. 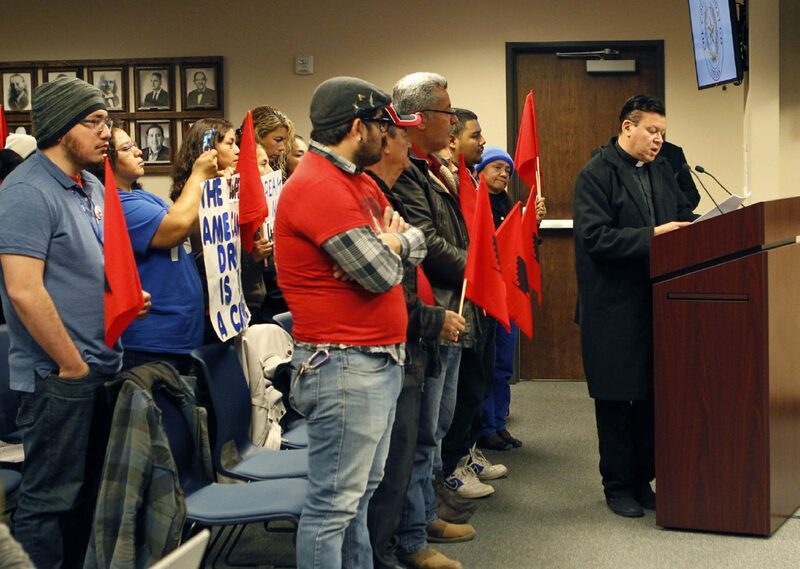 Rene Angel reads a proclamation in support of DACA in Spanish while surrounded by LUPE members Tuesday, January 16, 2018, during a commissioners court meeting in Edinburg. They also unanimously voted to send a copy of the approved resolution to U.S. Reps. Henry Cuellar, Filemon Vela and Vicente Gonzalez, as well as Sens. John Cornyn and Ted Cruz and to President Donald Trump. Marta Sanchez, a spokeswoman for the local immigrant advocacy group La Union Del Pueblo Entero, or LUPE, said Palacios reached out to the organization about the resolution last week, amid a fervor surrounding the federal court’s ruling which allowed for DACA recipients to submit applications for the rescinded program. While pro-immigration activists protested in politicians’ offices across the state and nation in favor of a clean Dream Act, one that doesn’t involve a border wall as a caveat, the Justice Department announced it was filing an appeal to a federal court’s ruling last Tuesday that delayed the end of DACA, which was rescinded by the Trump administration Sept. 5, and was set to expire on March 5. U.S. District Judge William Alsup, of the 9th Circuit in San Francisco, temporarily blocked the Trump administration’s decision to phase out the program last week. Alsup granted a request by the state of California, the University of California and other plaintiffs to stop Trump from ending DACA on March 5. The administration’s decision to end DACA, which was announced in September 2017, was based on a “flawed” legal analysis, Alsup wrote in his decision. Dreamers would be irreparably harmed if their DACA protections, which allow them to live and work legally in the United States, were stripped away before the courts had a chance to fully consider their claims, he ruled. That ruling came down hours after a meeting between Trump, U.S. House Appropriations Committee members and the Homeland Security Subcommittee to discuss DACA, which appeared to end with optimism from both the president and those attending the meeting. But Tuesday, a week after Alsup’s ruling, the Justice Department said it will ask the Supreme Court to overturn the ruling that prevents the president from ending the program, something that could take several weeks. “It defies both law and common sense for DACA … to somehow be mandated nationwide by a single district court in San Francisco,” said Attorney General Jeff Sessions.